This wild rice salad would be delicious served alongside these roasted vegetables (or just roasted brussel sprouts), mashed potatoes, and this turkey breast in crock pot. Growing up there were 9 people in my family and we went through food in our home QUICKLY. There were 4 foods (that I know of) my mom loved so much that she would actually hide them from us to ensure she’d get some before the locusts of kids descended on it. Those four foods? Strawberry granola cereal, caramel chocolate candies, plain milk chocolate, and pomegranates. But my favorite part of this salad? 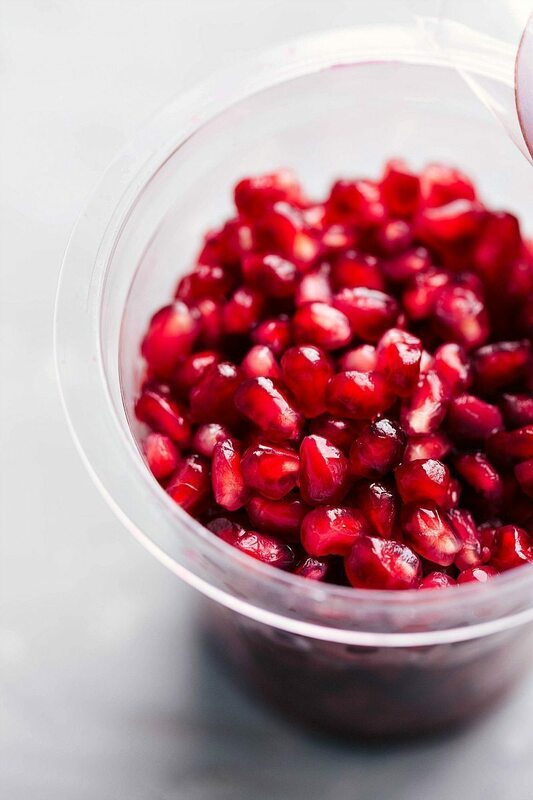 The sweet burst of flavor that comes from the pomegranate arils. 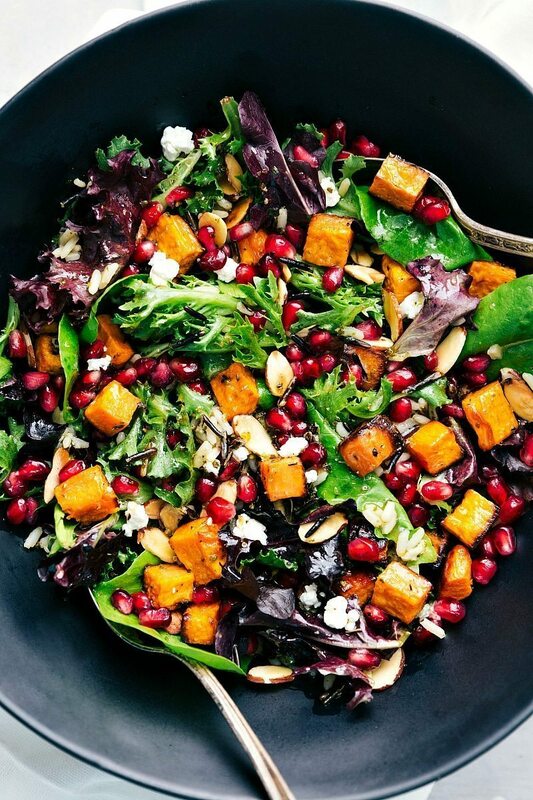 The POM POMS pomegranate arils add just the thing to take this salad from great to AMAZING. 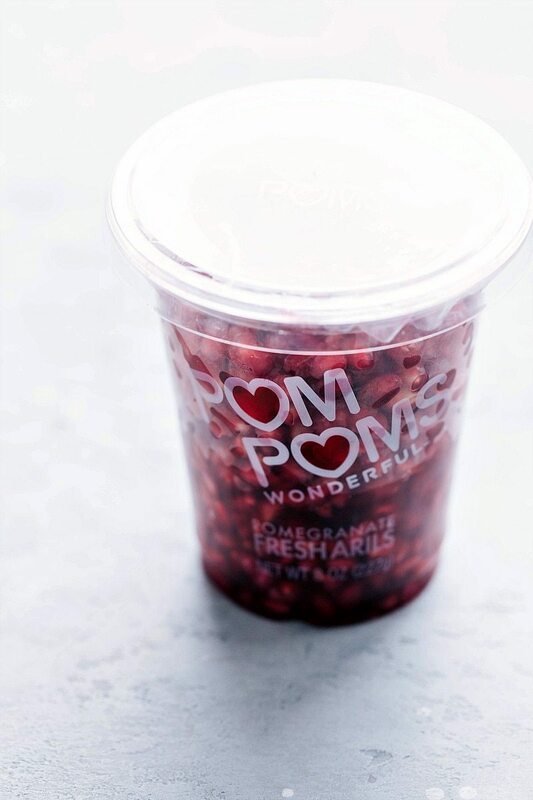 In case you’re unfamiliar, POM Wonderful makes POM POMS which are a convenient package of ready-to-eat pomegranate arils straight from their California orchards. POM Wonderful makes enjoying pomegranates and healthy snacking easier than ever! Besides how delicious and sweet pomegranate arils are, they also are known for their unique antioxidants and fiber. 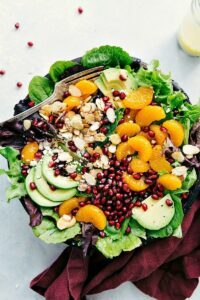 Pairing the health benefits of the pomegranate arils with all the other healthy ingredients in this wild rice salad, this is a powerhouse salad you can feel good about eating. To make this wild rice salad easier to make (and overall a faster prep time), I use packaged seasoned wild rice. 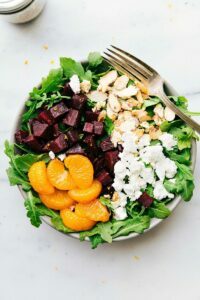 That way, you can prep all of the other components of this salad in about 20-25 minutes and by that time the rice is cooked perfectly. 2/3 cup wild rice (or 1/3 cup wild rice and 1/3 cup parboiled long white rice. It has to be the parboiled long white rice to cook evenly with the wild rice). And finally, let’s talk about the dressing! The dressing is so simple and doesn’t require many ingredients; most of which you probably already have. Everything gets combined in a mason jar (or a small bowl) and shaken (or whisked) together. 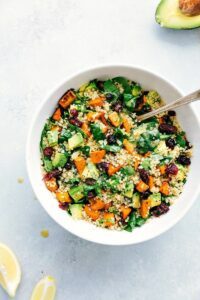 The dressing recipe makes the perfect amount of dressing for me, but like a lot of dressing on your salads, be sure to double the amount. This wild rice salad doesn’t store well after being dressed, but if you store everything separately from the dressing it keeps well for a few days. 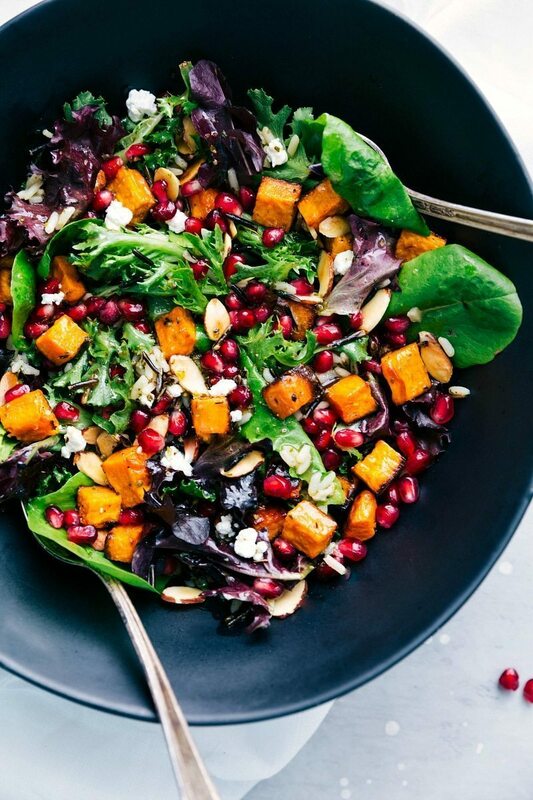 Mixed greens with wild rice tossed in a simple lemon honey vinaigrette topped with roasted sweet potato, pomegranate arils, toasted almonds, and goat or feta cheese. This pomegranate and wild rice salad is simple to make and bursting with fresh & delicious Fall flavors. 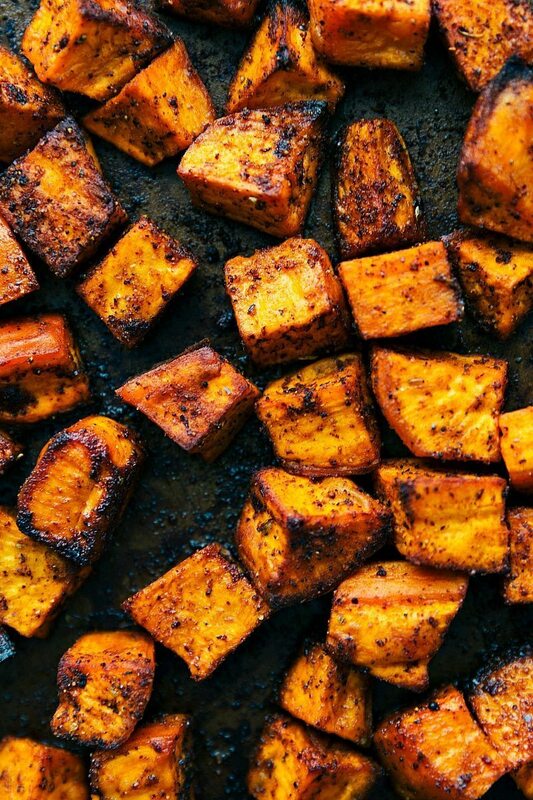 Preheat the oven to 400 degrees F. Peel and chop the sweet potato into small chunks. Toss the potato chunks in olive oil and sprinkle generously with salt and pepper. Toss to coat. Meanwhile, prepare the wild rice either according to the package directions if you are using a package mix OR according to the directions in the recipe included in the blog post (for a homemade version of seasoned wild rice). If you make the homemade wild rice, start with making that before roasting the sweet potato so they will be done around the same time. 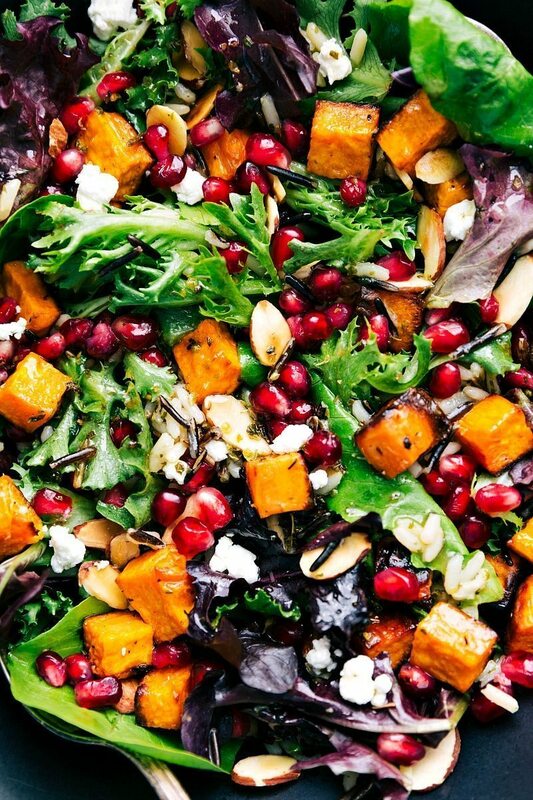 Toss everything with the dressing and add in some feta or crumbled goat cheese to personal preference. Increase the amounts of pomegranate arils or almonds if desired. Once dressed enjoy the salad the same day. If not finishing the salad in one day, store the salad separately from the dressing, almonds, and cheese. This salad looks delicious. 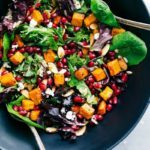 I love pomegranate seeds and am also looking for new recipes to use them on! Delicious. This looks great. My belly responded well to your article. lol thanks for sharing. Ahhh i’m so happy you enjoyed this! I can’t wait to see your picture! Sounds delicious! I made this salad for a family gathering last year and it was a real hit. I’m asked all the time to bring it again and also for your recipe. 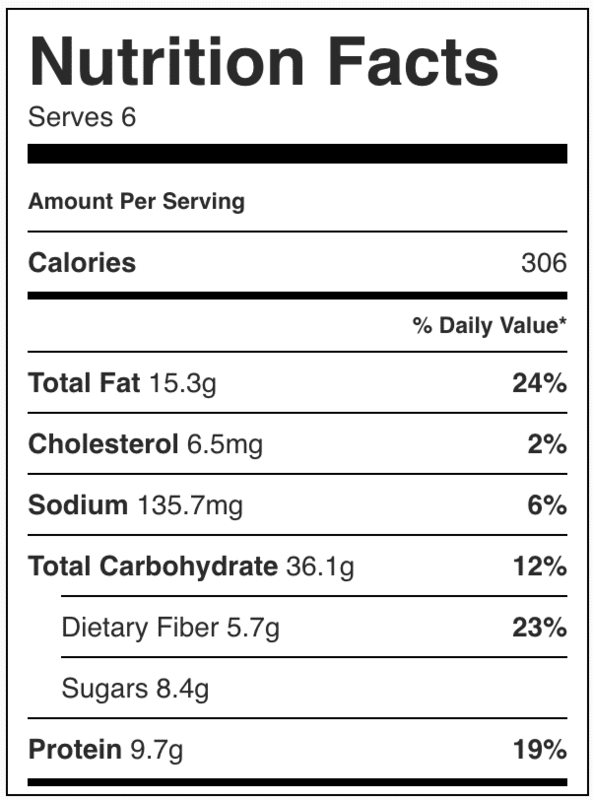 One question, in the directions you talk about cranberries but they are not listed in the ingredient list. Did you mean pomegranate seeds instead of cranberries? I would think they are interchangeable but the pomegranates make them extra special. Thanks again for a great salad recipe. You’re totally right; I updated it! Thanks Mary and Happy Thanksgiving! This recipe looks perfect. I am definitely going to have to try it in the nearest future! I have one question, though. If I can’t find wild rice, what kind of rice do you suggest subbing for? Thank you in advance, Chelsea! Yum, this looks so good and healthy!